The Department of Education today released a spreadsheet showing how individual districts will be affected by a cut in General Purpose Aid next school year that is $92 million less than what was promised when budgets were originally adopted by school districts for the current school year. The cuts were compounded for the 123 districts that are out of compliance with the school district consolidation law since their GPA was cut by another $5.9 million in penalties – money the department has redistributed to all the other school districts in the state. 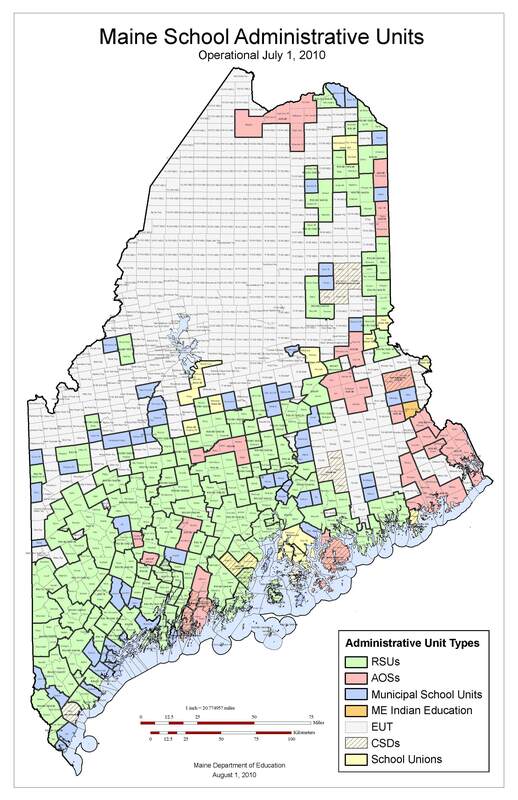 The spreadsheet can be seen at: http://www.maine.gov/education/data/eps/epsmenu.htm. It shows how the cuts affect each school district based on their valuation and enrollment – the two driving factors in the distribution formula. Those that have valuation increases above the 3 percent state average coupled with declining enrollments are being hit the hardest. The state’s more than 80 minimum receivers, who don’t get GPA through the regular formula, also are seeing their aid cut from 40 percent of special needs costs to 30 percent. The spreadsheet represents what is being proposed in the governor’s supplemental budget, which is cutting GPA this year and next in order to help fill a $400-million-plus revenue shortfall. The $911 million in aid being distributed for 2010-2011, includes $852 million in state GPA and $59 million in federal stimulus funds. The current year also is being reduced in the supplemental budget from just over $1 billion to $963 million, which includes $43 million in federal stimulus money. 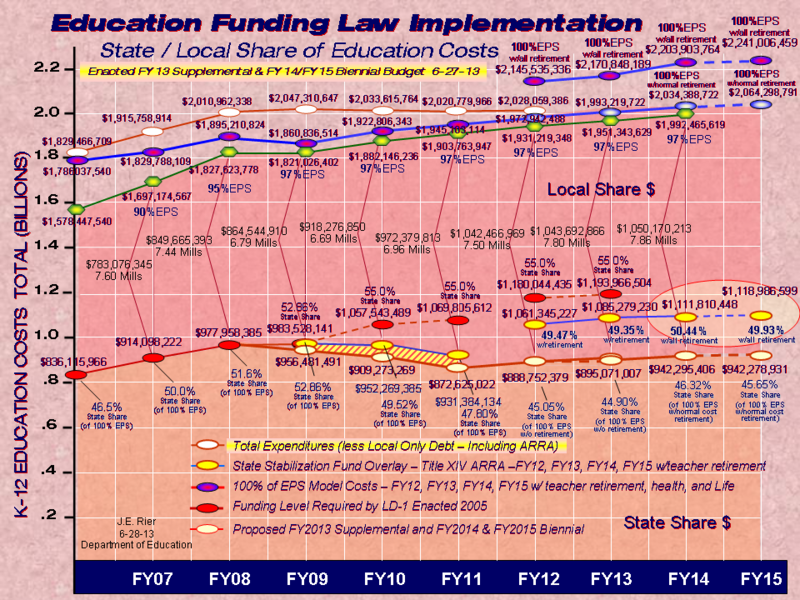 Federal stimulus funds will no longer be available to schools in 2011-2012. Some members of the Education Committee, which got an overview of the GPA distribution Monday morning, were upset that the penalty money already had been redistributed on the spreadsheet because it will make it politically very difficult for them to make any changes to the consolidation law. The penalties for those units that did not vote to consolidate as required by law were waived by the Legislature for the current year and there are proposals to waive them again. Other proposals under consideration would offer exceptions to the penalties for those districts that voted in favor of consolidation, but their potential partners did not, or those that are working on consolidation plans that aren’t yet finalized. Some members of the committee also were disturbed by a memo sent to them by Education Commissioner Susan Gendron giving a glowing account of the success of the school consolidation law and a caution to “get out of the way” of progress. “It’s saying what is needed is for us to get out of the way and let the law work. I think that’s the last thing we should do,” he said. The original goal of the school consolidation law was to reduce the state’s 290 district to 80 by July 1 of 2009, but 214 remain. There were 80 districts that came together to create 27 new regional districts, but 123 others voted down consolidation. Another 62 districts were exempt from the law and one proposal to merge two units into one is pending. The Education Committee is working on a carry-over bill, L.D. #570, An Act To Improve the Laws Governing the Consolidation of School Administrative Units, and will consider more than a dozen proposed changes this week, with a plan to vote out a final bill on Feb. 10.